Cleveland Cavaliers’ Collin Sexton (2) drives to the basket against New York Knicks’ Kevin Knox (20) in the first half of an NBA basketball game, Monday. 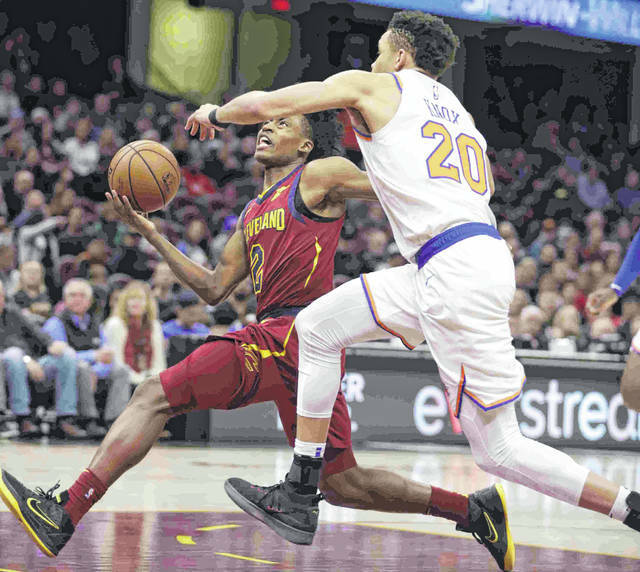 CLEVELAND (AP) — Collin Sexton scored 20 points and the Cleveland Cavaliers held off a late rally and sent the New York Knicks to their franchise-record 17th straight loss, 107-104 on Monday night. Cavalers: F Tristan Thompson (sore left foot) likely won’t play until after the All-Star break. He has missed the last 12 games. … F Cedi Osman (sprained right ankle) was out for the fourth straight game. …. C Ante Zizic (sore lower back) was a late scratch. https://www.limaohio.com/wp-content/uploads/sites/54/2019/02/web1_Cavs.jpgCleveland Cavaliers’ Collin Sexton (2) drives to the basket against New York Knicks’ Kevin Knox (20) in the first half of an NBA basketball game, Monday.